Former Cleveland Browns quarterback Johnny Manziel doesn’t need much time to get acclimated to his new surroundings. Despite joining the Memphis Express of the AAF on Saturday, Manziel could make his debut with the team as early as Sunday, according to Commercial Appeal. Manziel’s new general manager, Will Lewis, didn’t rule out the possibility in an interview with Commercial Appeal. “Going back to what he ran at Texas A&M and comparing that to the concepts we run here, there’s a good amount of familiarity, which leads you to believe you can put together a package or two for him where he’d be comfortable. That’s not a guarantee Manziel will receive playing time during Sunday’s game. But it also leaves open the possibility he might be used in certain packages. 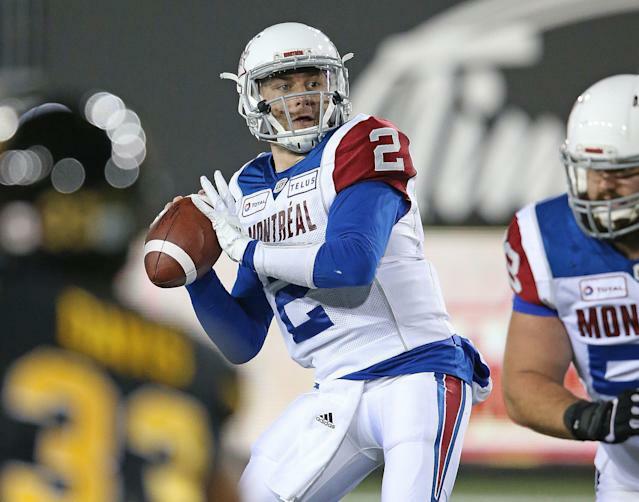 Lewis made sure to mention the team didn’t want to throw Manziel on the field too quickly, however, noting that seeing the field too early may have contributed to Manziel’s initial struggles in the Canadian Football League (CFL). It helps that the Express are 1-5 on the season and desperately in need of help at quarterback. The team has already cycled through former NFL draftees like Christian Hackenberg and Zach Mettenberger. The 26-year-old Manziel is still trying to show off his skills after he was released by the Browns following the 2015 season. He spent time in the CFL before he was released in February. Shorty after, Manziel joined the AAF, and was claimed on waivers by the Express after the San Antonio Commanders waived his rights.